If you're in direct marketing or simply deal with a fair share of email marketing campaigns, you would have no doubt included a 'forward to a friend' option in your emails. You would have then certainly looked at the campaign statistics surrounding your 'forward to a friend' option and somehow convinced yourself that it is still worth keeping...yes? I must say that sadly, up until only a few campaigns ago, I nostalgically cradled the idea that people would still want to click on 'forward to a friend' instead of simply using the forward option of their email client. I was also part of the minority who would occasionally click on this option out of mere pity for the campaign creators still using it and continue to annoyingly type out my name, full email address, my friend's name, their email address (often having to double check it). All this in the hope that when I included a 'forward to a friend' option, the same courtesy would be reciprocated and recipients would click on it. But no more! Who is that one friend? That one whom we must share this email with anyway? I have Twitter followers, a number of Linkedin connections, friends on Facebook, Pinterest, Tumblr and Google+, all of whom I want to share this content with and you're telling me to 'forward to a friend'? Really? 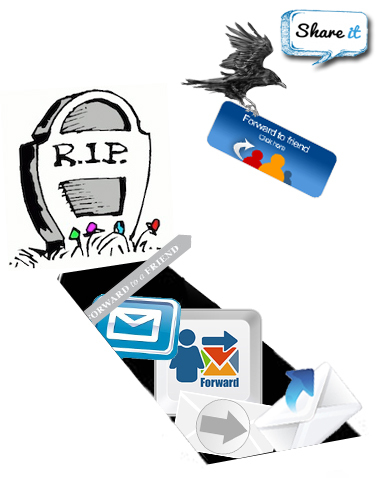 The way we digest information has evolved significantly, hasn't the act of sharing emails evolved also? If what I've been emailed is a great read, then I won't hesitate in sharing it. I expect those who I'm connected with, to do the same giving me the opportunity to like, share, favourite, retweet, reblog and/or repin it. It's frustrating to read an article that claims email marketing is dead, and social media is now 'how we do things'. Social media is important in how we as marketers do things, but email is far from dead! Though SPAM is still prominent, and companies still send an email before thinking; we are getting better and becoming more conscious of user experience outside of our own website(s). Products like Yammer (Microsoft) will certainly help alleviate the pressure of internal company servers; with that being said, server technology is getting smarter and cloudier... So yes, Yammer will reduce the CCing that goes on within a company. Facebook and Twitter et al will continue to reduce the emails between friends and colleagues. Emails though, will not yet conceit defeat nor will their importance be diluted, in fact an email will remain the gateway to accessing most social networks. Have you ever tried joining a social network without a valid email address..? Exactly. REMOVE THE FORWARD TO A FRIEND OPTION AND REPLACE IT WITH SOCIAL MEDIA SHARING OPTIONS. IF THE EMAIL CONTENT IS A GOOD FIND AND WORTH SHARING, PEOPLE WILL NOT HESITATE TO DO SO. RESPECT EMAIL ADDRESSES. DON'T SPAM!